When first came to USA I don't know A-Z in cooking. Then slowly I tried out recipes from books, my MIL,friends and web. With encouragement and support from many I can cook and many has enjoyed themselves saying that the meal served was delicious.We had my son's 4th birthday in Owasso and for the first time my hubby invited his office colleagues. I was to cook for about 25 people both veg and non-veg. I did managed to prepare them with my friend's help . Ghee rice and grilled buffalo wings become very popular among them. When we left Owasso some of my hubby's friends mentioned that they will be missing my grilled buffalo wings and ghee rice. Actually I wanted to post the recipe for sometime but end up posting something else. While preparing this for the first time my hubby accidentally brought a packet of green peas with pearl onions but it become a blessing for me as everyone really like that taste.Instead have them plain I have paired it with sardine and white kurma.. Boil all the ingredient -allow them to cool of and then grind to a paste. In wok add the ghee and splutter the mustard followed by the chopped onion. saute till the onions are browned-add the all the spice powder and saute until the raw smell are removed. Finally add the vegetable sand grind paste. Ad more water if necessary and bring to boil.Adjust the level of salt and pour in the coconut paste.Allow to simmer a bit-then remove from flame and transfer to serving dish. Open the tin of sardine using a can opener. Heat a non-stick pan with 2tbsp oil . Once heated splutter curry leaves,mustard seeds and cumin seeds. Then add the sliced onions and fry til the onions turn slightly brown followed by tomato. garlic and all the masala powder. Fry till the raw smells of the spice powder are removed. Finally add the sardine -once the the gravy starts to pour in the tamarind juice. Let the gravy sim for 10 minutes-adjust the level of salt and remove from flame. Garnish with chopped coriander leaves and serve hot. Awesome ghee rice n kurma... Loved the combo!! nice recipes! whenever I do ghee rice, it is definitely a kurma beside, wonderful combination!!! sardine curry sounds equally good too!!! Wonderful combination. The curry and ghee rice looks delicious and mouth watering. Slurpppp, sardine curry makes me hungry...lovely spread..
Never tried ghee rice..looks super yum !! 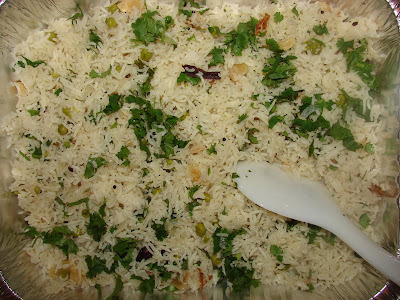 i love ghee rice.yours is yummy.